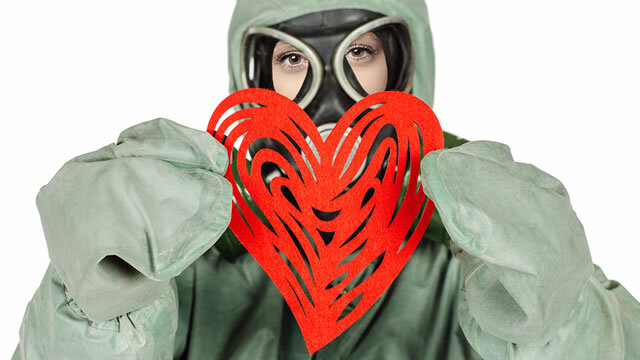 For some, “toxic relationship” has become a sort of buzz word. If it’s a relationship that’s hard, uncomfortable, and more work than play, many of us are quick to label it as toxic. But in all reality, if you’re in a toxic relationship, it doesn’t just mean you’re in a tough relationship. All relationships require work—some more than others. But when that work centers around overcoming deal-breakers, then you know you might be in a toxic relationship. Being in a toxic relationship means you’re tolerating deal-breakers. And typically, you’re tolerating those deal-breakers for one reason: You’re afraid of change. The big problem with this approach is that your fear of change acts as a sort of prison, keeping you in lock-down mode as you sacrifice your time and emotional energy, all for the “benefit” of keeping the relationship afloat. Putting up with an abusive relationship because you’re afraid of a reality without that person (fear of uncertainty). Ignoring a damaging addiction because you can’t face the thought of anyone finding out (shame). Letting things slide because you’ve decided that you’re really the reason behind his/her unacceptable behavior (guilt). If you’re in a difficult relationship and you’re having trouble determining if it’s toxic, start with these three questions. Do I see my role in/contribution to the relationship’s problems? Ever hear the phrase, it takes two to tango? All relationships are a dynamic between two people. Each of us brings things into the relationship that introduce challenges. Believe it or not, if you’re in the middle of a tough relationship, determining if it’s a TOXIC relationship starts by taking responsibility for your role in the problems. It’s a task that can be really hard to do when you’re in a relationship with someone who is clearly “the transgressor.” To get started, you have to be willing to filter your own story through inauthentic pain emotions. (Download the list here). Once you’ve filtered out shame, blame, guilt, outrage, pity, and self-pity (all the inauthentic emotions), you’re left with your authentic emotions. These are the emotions that will help lead you to true clarity. Anger at the way this is affecting you now. Grief over what has happened and what has been lost. Confusion over what you don’t understand. Uncertainty about what might happen if things change. Regardless, whether you determine the relationship is toxic or just plain difficult, if the relationship is going to thrive, the dynamic MUST shift. This shifting begins by taking a long, hard look at your own side of the street—and determining what you need to do to clean it up. Am I making choices based on what’s happening or on what I hope will happen? Let me make this clear: There is a definite time and place to live in a season of hope. We are flawed human beings who cannot thrive and survive without the grace of others. We need accepting spaces where we can stumble and grow, and if we love someone, we must be willing to grant that space. But. . . when you find yourself in a situation where you cannot ask hard questions because YOU’RE afraid of the answer, it’s time to take a big step back and work on being honest with yourself. For years, I lived within the ruins of a broken marriage because I was too afraid of an alternative outcome. I spent years hoping that if I just practiced more patience, if I’d just hang in here long enough, if I’d just be a better wife, then the reality I had hoped for would finally come true. Clearly, radical self-honesty was not on my list of priorities. I spent a lot of years refusing to acknowledge my own deal-breakers—and that was a choice that kept me locked inside a toxic relationship for far too long. What are my deal-breakers? Am I staying true to them? Even really great relationships have irreconcilable differences that are NOT deal-breakers. Perhaps this is where the “agree to disagree” cliché comes into play. Accepting that differences will exist within a relationship is vital to the health of ANY relationship because, without honest differences, no one can be fully authentic. So, it’s not the differences you need to be concerned with. It’s the deal-breakers—the issues that will take us further than we know we ought to go, if we’re being true to ourselves. But living with someone who consistently disregards your boundaries (e.g., drug and alcohol addictions, emotional or physical abuse, neglect, infidelity. . . )? This is when we run the risk of being dragged into the emotional hinterlands. Too afraid to draw the hard line in the sand, we wind up venturing into a barren, emotional wasteland with a friend or a partner, only to find ourselves abandoned, rejected or dominated, over and over again. How do you avoid this? Ask yourself: How far am I willing to go? It’s perhaps one of the most important questions you can ask yourself. Once you answer that question, ask yourself the next critical question: How far is s/he willing to go? It is only here—in this space of understanding your boundaries and understanding the other person’s willingness—where you can start to make forward-moving decisions. If a husband isn’t willing to care for his children, then you have to decide if you’re willing to accept that. If a child isn’t willing to seek help for their drug addiction, then you have to decide how far you’re willing to travel down the road with them — manipulation, lies, physical harm: it’s all part of the game here, and you have to determine how much you’re willing to endure. If a friend isn’t willing to be honest about her compulsive lying, you have to decide how a friendship can exist in spite of her persistent dishonesty. Have you determined you’re in a toxic relationship? Wondering what steps to take next? Consider the six steps below, and as always, please reach out in the comments below with any thoughts or questions. Tell the truth about why you keep the toxic relationship on life support. Take responsibility for your role in the dynamic; then stop behaving that way. Demonstrate the change in yourself; then ask for the change you want (if there is something you want besides just to leave). Make a plan with the help of an experienced, trusted advisor who has no stake in the outcome (e.g., therapist or a lawyer). If you really have decided to leave, don’t discuss it with people whose emotional reactions might get in your way of taking care of yourself. And finally, when it’s time to go, brace yourself for the reactivity of others. Preparing for the reactivity of others is a vital part of self-care while separating from an ex or a former friend. This is the perfect time to appreciate the concern others have for you but not get caught up in convincing anyone that you’re doing the right thing, etc. At some point there is nothing left to do but inform affected parties, and then take action on your plan.